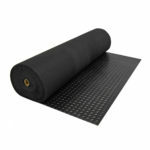 Rubber mats offer homeowners and business-owners an affordable option to make accident-prone areas safer. Home gyms and children’s play areas are perfect areas for rubber mats to reduce accidents from falls or slips. 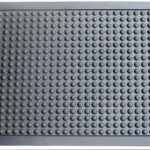 Rubber mats can also protect the floors beneath, say from a dropped weight. Interlocking rubber floor tiles, like the Diamond Interlocking Floor Tiles or the Fitness Interlocking Floor Tile, are an affordable, DIY floor option to reduce slips and floor damage. For business owners, falls can be an insurance nightmare–not to mention embarrassing and painful for the customer or employee who falls. 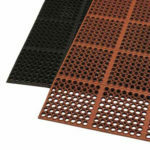 We have a wide variety of rubber mats for all areas. 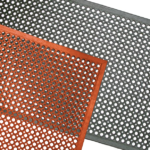 Our Cool Coin mat or Holy Toledo mat is perfect to whisk spills away in commercial kitchens. Anti-fatigue mats like the Jonathon energize employees at cashier stands, assembly lines, and waitress stands. Add traction attractively with our Diamond Dandy– perfect for high traffic areas like entryways. Since it’s impact absorbing, the Diamond Dany is also great to protect floors in industrial areas. Cool Coin and Diamond Dandy come in rolls for large projects. 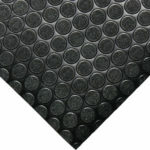 Rubber mats can also be ordered by the pallet for large jobs. How will you put this hardworking, versatile flooring to use?